Got big toe pain? Think it’s gout? Think again! Things are not always what they appear to be. This gent came in with first metatarsophalangeal pain which had begun a few months previous. His uric acid levels were borderline high (6) so he was diagnosed with gout. It should be noted his other inflammatory markers (SED rate and CRP) were low. Medication did not make the symptoms better, rest was the only thing that helped. The backstory is a few months ago he was running in the snow and “punched through"the snow, hitting the bottom of his foot on the ground. Pain developed over the next few days and then subsided. The pain would come on whenever he try to run or walk along distances and he noticed a difficult time extending his big toe. Examination revealed some redness mild swelling over the 1st metatarsophalangeal joint (see pictures above) and hallux dorsiflexion of 10°. If we raised the base of the first metatarsal and pushed down on the head of the 1st, he was able to dorsiflex the 1st MTP approximately 50°. He had point tenderness over the medial sesamoid. We shot the x-rays you see above. The films revealed a fracture of the medial sesamoid with some resorption of the bone. 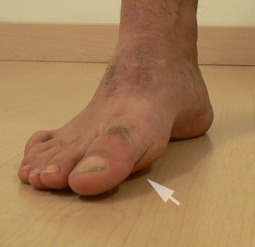 The sesamoid fracture caused the head of the 1st metatarsal to descend on one side, and remain higher on the other, altering the axis of rotation of the joint and restricting extension. We have talked about the importance of the axis of this joint in may other posts (see here and here). He was given exercises to assist in descending the first ray (EHB, toe waving, tripod standing). He will be reevaluated in a week and if not significantly improved we will consider a wedge under the medial sesamoid. A pretty straight forward case of “you need to be looking in the right place to make the diagnosis”. Take the time to examine folks and get a good history. Podcast #28: Nanotech, Athletes & Barefoot ? Technology is advancing so quickly that it won’t be long before the era of performance-enhancing drugs seems like the athletic Stone Age. Injecting or ingesting chemicals will be considered primitive when athletes will have the ability to have robotic cells powered by software coursing through their veins. I have a question about peroneus longus in relation to “morton’s toe”. I did a very deep deep massage for an extended length of time and found that when I put my foot on the floor afterwards, the first metatarsal head was no longer raised!! Can you advise what may cause the peroneus longus to become tight, and if there any good stretches for it? 5. Do orthopedic shoes really help? Well, they do seem to assist in foot placement and can enhance proprioception, so in the right circumstances, they can be an excellent adjunct to exercise and rehabilitation.